If at any point You step down or are asked to leave the club, you will be required to relinquish your club patches and return them to your chapter president. As long as you remain a member in good standing with the club, you will never be asked to return your patches. Any other band, ethnic, cultural, military, nationality, sports team and flag patches are left to your discretion, but we prefer that you keep non-band patches to a minimum. There are certain types of patches that are frowned upon e.g., patches displaying anti-American sentiment, racism, bigotry, etc. We are a punk & metal club, it's all about the music & the lifestyle, so emphasize that on your battle jacket above everything else. If you feel that you want to take the first step towards becoming an active member, then contact your local chapter or any G.M.A. member you interact with or run into at a show or on the street and ask them to point you in the right direction. Read our F.A.Q. section for more information. 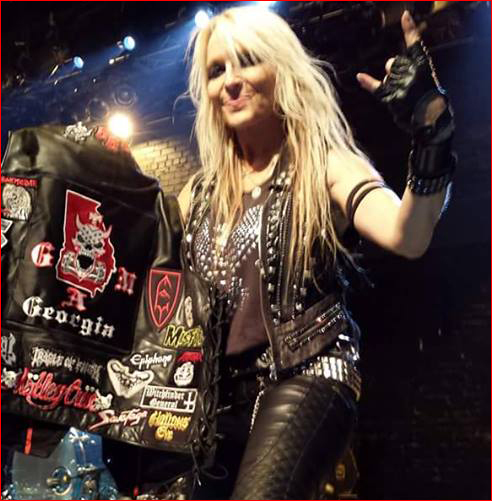 Doro Pesch Showing us some love!